Having worked in community garden in Edinburgh ('Wheatfields' in Gorgy with Re:Solution), I returned to my home town of Ipswich in Suffolk with ideas, inspiration and experience. Living in a large house share of like minded folk and evening chats invariably involved "there's this thing going on that you'd love Dan". This scheme I was told about was based in the local Community Volunteer Service building so I went in and said "how can I help?". The Town and Bridge project (now ActivLives) had an ambitious plan to start a community garden and were preparing for an ITV People's Millions phone vote where viewers decide who get the cash. They/We won £82K and Julie had the task (ongoing) of dealing with the consequences. I got a 2/day week job with another part time horticulturalist and a full time horticulturalist/ co-ordinator. In an overgrown field, myself and the others set to designing the garden. PLANTS: a Poplar tree, a huge clump of bamboo and couch grass. A few tulips and not many wild plants apart from lovely Campions (Silene). Nothing cultivated here for at least 10 years but no brambles. Council had cut it sporadically. Insect pollinators. Most unwanted: dogs, pigeons, butterflies (no rabbits onsite . Deer spotted but not an issue luckily). No livestock as we just couldn't be on site regularly to keep them. ​Initially just the bowls hut 300m away. It started as a grass triangle. We knew that we need shelter, cups of tea, warmth, an office, a tool store, a toilet and a polytunnel but nothing was initially planned. Toilets and Electricity do not appear on allotments as a rule. We did have funds for capital items so we set about dreaming. Ideas for a container (shelter, office and tool store), polytunnels, bike storage, teaching space, welcome area. Hard landscaping, water collection. A sports club behind the shed seemed very separate to us. Our only shelter initially was a run down community bowls hut which we could make hot drinks in and use the toilets next to the allotments. Yes we needed a set of everything and had funding for it. But how much and of what kind? We had to get approval via our boss Julie, she liaised with the Big Lottery to get approval so it had to be designed and planned in advance. We were a community resource and events would be a big part of what we did. Open days, help building and learning opportunities. Also we had to be open to locals and interested folks for regular sessions. 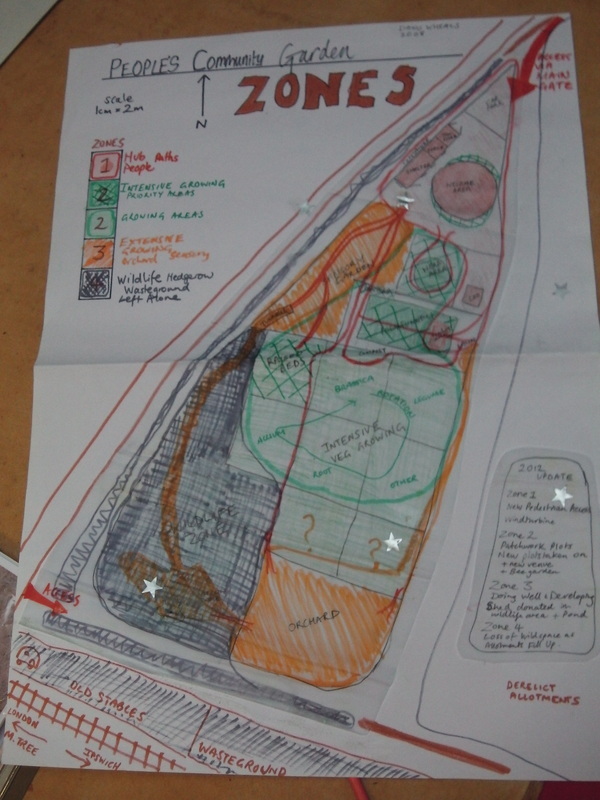 A food growing and community growing project so lots of scope for creativity. Location: In a council estate - Maidenhall, Ipswich- with no through traffic and no direct route so hard to find. There is a bus service to the gate from central Ipswich taking 20 minutes and people could follow our progress via the train window as it sped London bound. Two site entrances for cars but keeping gates locked means hard for visitors to say "we're here". Our plot was in a derelict corner but close to the public edge so we are separate from the main allotment plots. Volunteers, staff, groups (school, probation, corporate), locals, plot holders. On a council allotment site which was only a third used and a survival mentality blighted those plotholders on site to the concept of change, especially the thought of youngsters and probation helpers coming to the site. Non allotment holders that we noticed were dog walkers and those using a pedestrian cut through nearby especially at school finishing time. We had a band of volunteers via the TV phone vote mainly via local NGO'c and some initial interest from residents but locals were mainly quite dismissive and unaware. Staff wise we had four in our team, Ric and me 2 days/ week. Susannah 4 days/ week and Julie managing us. None of us were locals although I was initially but then moved one train stop away. Potential: sandy loam soil, good south facing aspect, lots of space and seemingly room to expand in the future. No infrastructure but a team full of energy. It is a very exciting prospect to start off a project like this. 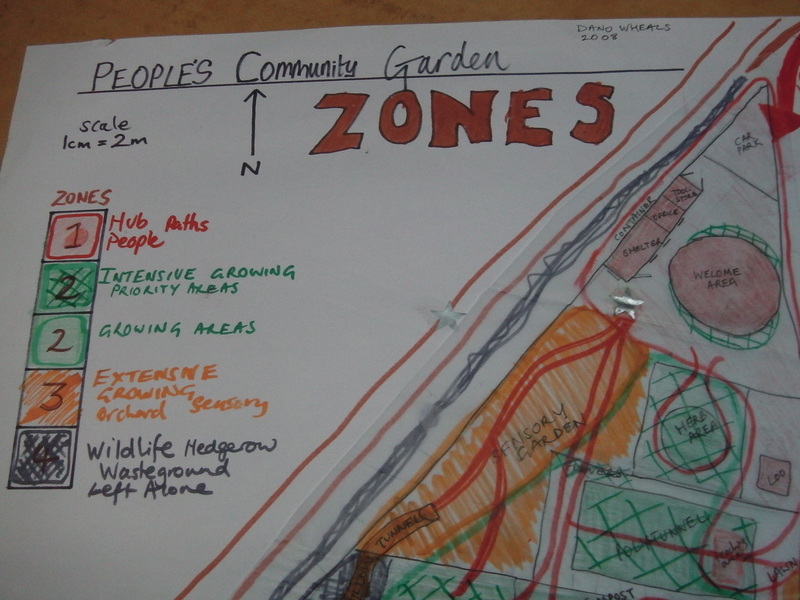 So we'd got the funding, had the site, staff were employed and together with enthusiastic locals we wanted to turn an area of disused allotment to a community garden. There were meetings and discussions and plenty of ideas. Initial designing ideas were banded about in conversations, then my colleague Ric and I were asked to sit down together and plan it all. We had a few considerations from our Boss, Julie who we considered our client as all decisions needed her approval. We both had permaculture knowledge and decided to get the base map sorted. Over two days and plenty of black coffee between measurements, drawing a base map, planning infrastructural needs, what crops we wanted to grow, thinking what groups would use the site, how best to use the site with paths, willow, taps, wild areas, etc etc. Our dream was to link with other 'health' and 'community' projects like lunchclubs, get folk involved and we had 2 years funding to start with. There were many facets to the designing, many not in my control so this diploma design focuses on the land we had before us- what we wanted and where it should go. Tape measurements led to pencil drawings of a roughly triangle shape. We marked out the area using bamboo stakes chopped from an overgrown clump onsite, measured everything and got a base map together. 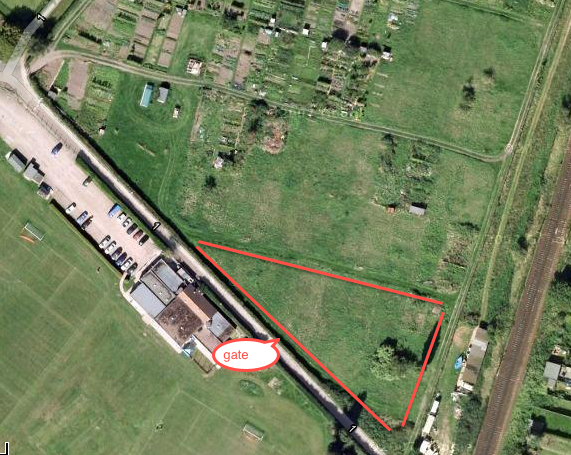 With the help of google earth maps (see below with red outline or click link - gate added 2 years later). On zooming in, we found that there had already been plots 10m by 30m and this helped us a great deal to work out the plot sizes. This also helped us create 10m by 10m blocks as when we explored we found out that there were buried plot demarkations so it seems sensible to use these 100m2 blocks in our designs. 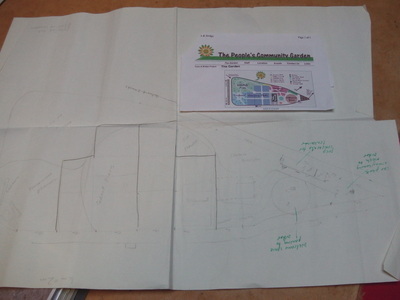 The paper diagram below was a first draft working out what we had. Money: we had £82,000 but half of that was salaries. Capital items were itemised approximately in the funding bid. Future sustainability is always an issues for such projects. Ideas: Knowing what we want - often you can get by asking but you need to know what you want. Our shelter and toilets and office space is currently unknown. Local Apathy: There is little expectation that what we are doing will work, will be relevant to locals so when someone falls in love with the project like I did it is such a boost. We have this money from the ITV People's Millions Big Lottery of £82,000. An enthusiastic team with wages secured for 2 years and a management organisation - Town and Bridge Project - set up as two wards of Ipswich had drastic health inequalities. No need to evaluate whether to proceed to design work as it is clear that that is the next step. Without funding the design may well have looked very different. A large shipping container reconditioned for shelter, office and toolshed - fitting as we could see the tops of the cargo ships in Ipswich docks from the site. It had to be lifted over a hedge so the siting of it was limited but it became a design opportunity. A posh compost toilet from Natsol. £16,000 quote for flushing 'normal loo' due to no sewerage and visits to one such flushing loo proved not easy to maintain. A visit to a compost toilet on a community allotment in Norwich proved cheaper (£6,500 for disabled metal clad delux version) and my boss was astonished that a compost toilet would be so 'acceptable'. She forbad the word loo, it was to be called a toilet. 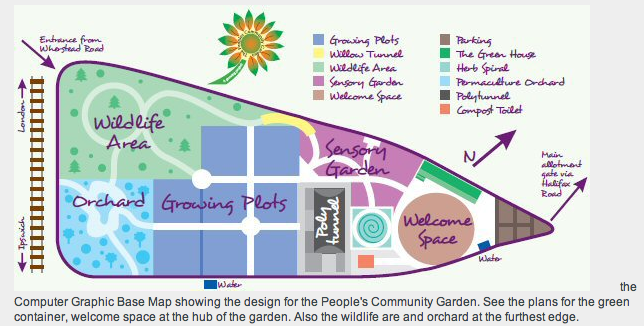 A local councillor gave £2,000 for a polytunnel in locality funding. In fact we naturally came up with the idea of Zones via this bouncing ideas of each other. Ric and I had a list of components that we needed to include in the design and used a zonal approach to fit the pieces together. We worked on the presumption that other ideas would be added. We considered how to encourage cycling of compost, water; the routes and journeys that would be taken, who would use the site and what they would need in terms of access, shelter etc. The main entrance to the allotments is to the right so we knew we needed to have disabled parking/ off loading area to keep cars off the rest of the site. Arriving to a welcoming space was important for group visits and for a sense of community. We had ordered a container that had lockable tool store and office as well as a shelter/ tea making station. The container was located near to edge for boundary marking, shelter but mainly as it had to be craned over the hedge. Each element of our design had factors for and against its potential placement. After a day of discussion we had make up our minds and understood the site, run through lots of what if scenarios and captures thoughts about water runoff from here to be used there etc. I created my own ZONES and aimed to rationalise the placing of items with respect to these zones. ZONE 1: HUB. PEOPLE'S NEEDS. Access, tea breaks, boots, welcome zone/ gathering zone, toilet, most used paths. Office, disabled parking. ZONE 4: WILD PLACES: If any on an allotment! but furthest from our Hub. Deal with later. Open 4 days/ week, groups whoever we could get. The welcome area turned Olympic Stadium and got shading sails for summer usage. Used for Packed Lunches, seated tea breaks, group gathering and inductions. Water collection from the sink in the Container and our hand wash sinks fed the Willow tunnel. Pond area and donated shed in wildlife garden. Chantry High School next door used us a lot. 3 local primary schools too. Expansion into neighbouring plots. Initially given to people as the plot filled up but those lapsing allowed the garden to grow more. Within 3 years the allotments were full!!!! previously one third full. Other groups, Transition allotment. Schools, Bangladeshi women, Prisoners, exercise classes. Ongoing financing was hard but projects continues to recieve support. Side Entrance put in. The single best thing to encourage interested locals. learning about Permaculture and we discussed everything in terms of zones, hubs, distance needed to travel etc. Future tweaks: wheelbarrow chain up, sinks for hand washing and tool cleaning, side storage on the container. Since I left the project has taken over Chantry Park Disused Walled garden and greenhouse nursery. A Bee garden and apiary and a whole host more community health initiatives. The project continues and I love the fact that I helped start it off. ​Visiting in 2014 the garden is going strong and many of the initial ideas have matures like the orchard, hedges, various plants. Employing a Handyman, Steve, to do the building work was critical as we were all gardeners and struggled with the building. If Only we had him earlier as I found building and construction my biggest headache. I have learnt that a space in the middle with views of whole plot is a good idea for events. Access for locals to encourage them in is vital. UPDATE 2017: The Gardens are going well and the project has grown to a nearby site and taken over the bowls hut as well as a community venue. WE achieved what we set up to do and nearly 9 years on the orchard is maturing and the paths are well trod. This is the learn from your experiences. Plenty of those. Drawing base maps and having them point north in the drawing. Documentation of write up evidence. Seeing what has worked and what hasn't. I think the main Tweaking would now be for the extended gardens as a whole and to measure what the aims of the garden are, sustainability, attracting people to the site - what skilled help is needed and repair and renewal of areas. These things happen with time but if redesigning I think it would be good to do as a consultancy job to identify areas needing extra attention. I do not intend to do this unless asked but I will seek testimonials and make a plan of what I can see needs doing. What is still working well? The garden is still used well by groups. The layout inspires people still, the toilet works well. It is still going. The site gate has continued to allow visitors in easily. The main issues relate to use of the site when it is busy on open days and a lack of a place to eat. On event days the central place should be in the middle of the site rather that the welcome area at the entrance. The herb spiral gets cramped when using the clay oven. Finally the angles of paths can make it hard for wheelchairs. Ironic we were told to put little barriers to stop people falling into the beds which have turned into trip hazards. There is ongoing issues with funding and as new people take over areas of the garden many plants are lost to over weeding. Some areas have been quite intensive too weed especially when folk are unclear what is a weed and what isn't. How has the garden progressed? 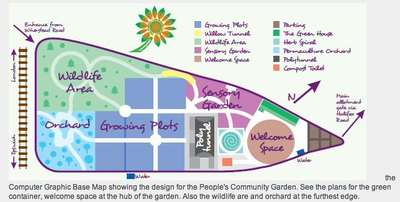 It has a new polytunnel and areas for young gardeners. It has committed volunteers. The local bowls pavillion is now a community cafe and the old council nursery a mile away is part of the project now. It has grown well. What feedback from the design do staff have? All in all really good with enough flexibility to adapt. It would be good to have continuity and proper use of the vegetables cooked on site. The original design drawing is still on the noticeboard after 8 years. People still love being there. Did the design process work? I found OBREDIMET useful to catch information but a bit cumbersome looking back at the large amount of text. The outcome worked really well and the People's Community Garden is still thriving. My skills are with people and ideas not construction. Seeing my zones basemap drawing, it looks very messy and not fit for purpose if presenting to a client. I have also learnt that to be a better designer, I need better drawing skills and designs are best if they can be used, tweaked and added to by the clients. 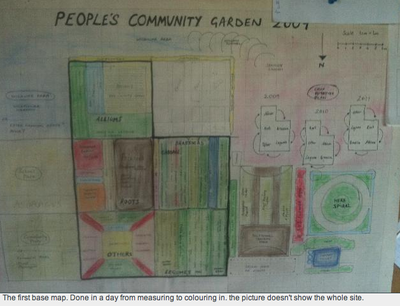 All in all I look back and see the opportunity to part of the design and set up of the People's Community garden as still relevant to the work I am/ wish to do with community herbal gardening. ​Ric and myself both knew about permaculture. It was the extras like using the polytunnel placement for shelter and wind break as well as good access and as little shading as possible. I enjoyed the joint planning process and the ease of Zones to place new items. We did consider the 12 principles of Holmgren when applying for Land Centre status. 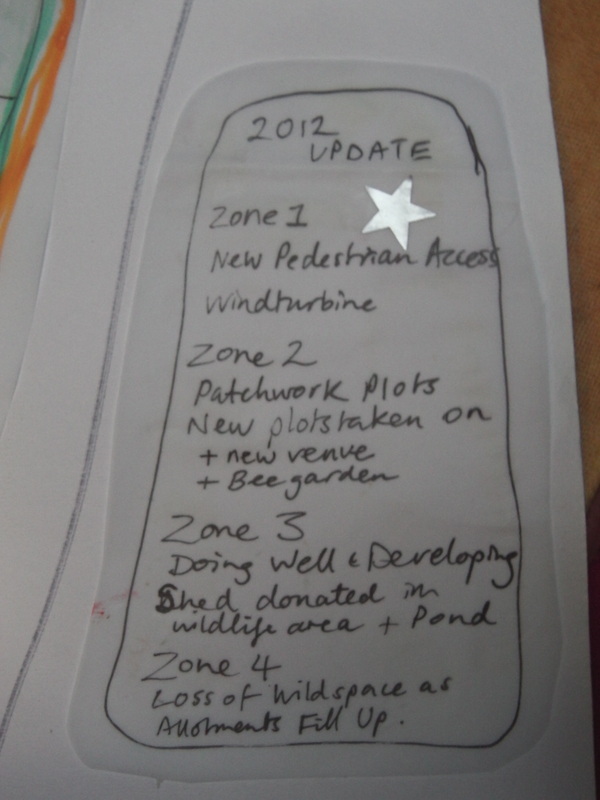 But the zonal approach really helped us place items and prioritise the work to be done. It was a simple enough concept for people to understand. A community project set up to connect people with their local green space. A charity and open to anyone to attend. WIN WIN WIN. All three ethics were central to the project ethos and approach in designing the space. Use the Edges and Value the marginal: edge of a run down allotment on the edge of town, interacting with people who were excluded and isolated. Obtain a Yield: aimed for volunteers to always go away with something in their hands. Social yields as important as food. Creatively Use and Adapt to Change: constant learning about groups, volunteers- what worked - where to get funding from. Slow and Small Solutions: We initially had funds to spend so it was a quite top down process. Catch and Store Energy: We missed several chances to use the food we produced. The CRESS community cafe helped to address this later in the project.